"Bally High! This sweet and luscious bread will whisk you away to the South Pacific. 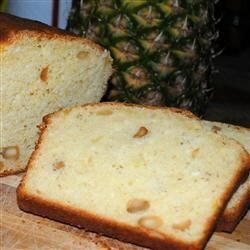 Pineapple and macadamia nuts are together again!" Preheat oven to 350 degrees F (175 degrees C). Lightly grease a 9x5 inch loaf pan and line with wax paper. In a large bowl, combine sugar, eggs, vegetable oil, pineapple juice and pineapple; mix well. In a separate bowl, sift together baking powder and flour. Stir flour mixture into pineapple mixture. Fold in macadamia nuts. Pour batter into prepared pan. Bake in preheated oven for 50 to 60 minutes, or until a toothpick inserted into center of loaf comes out clean. This bread is good, but lacks pineapple taste and is a little dry. You may try increasing the amount of crushed pineapple. 4 eggs is too many for this recipe! 2 eggs is plenty. I did not like the flavor of the bread and also felt that it is a badly written recipe. This bread did not cook well it browned too fast so I put foil on. I also had to cook for 20 minutes longer. It's sweet enough. Overall not what I thought. Too heavy and tasteless. I made a pineapple glaze which helped a little.